Paul Le Vesconte, 55, was at home in Bromley one Sunday morning when he started feeling severe pain in the centre of his chest. He went to bed, but this did not relieve the pain, and when his wife returned home she called 999 for an ambulance. Paul was attended by Emergency Medical Technician Shaun Taylor, in a car ,and an ambulance crew, Paramedics Sonia Watling and Jacqui Lindridge, within a few minutes. They carried Paul to the ambulance where, using specialist equipment, they established that Paul was having a heart attack. At King’s College Hospital, Paul was handed over to the cardiac team who confirmed he was having a heart attack and admitted him to the operating theatre. Paul underwent a pioneering procedure called primary angioplasty, where the blockage in the artery causing the heart attack was removed by inserting a small balloon and inflating it. 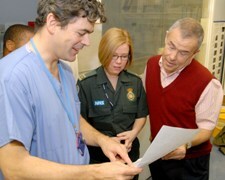 Within a couple of hours of arriving at hospital Paul was in a ward recovering from his operation. In three days he was back at home with his wife. Paul said: “On the day, everyone did a fantastic job in coming together to save my life, and it’s been great to meet them all since then to say thank you.